Lately there’s been a lot of discussion in the media about identity. It’s made me think about what you have written before, that I am supposedly a son of God. But when I look about myself, I find that I am evidently just a menial laborer barely scraping by to provide for my family. No goodness here; no greatness here. You know, I tried praying and fasting, like the Elders told me to do, to see if I was really a son of God. I don’t think they expected my answer: fear. Fear and a little loathing for the blows dealt me over the years that haven’t landed me that executive job in the big city. Thanks for all of that, God. Maybe you are; but am I not a son of God? I seem to have been made for lesser things. First things first: we are all children of God. Identity theft has been Satan’s big gig lately, and he’s really stealing the show in our generation—and he’s laughing about it. I’m going to share a story with you that will demonstrate why this particular peculation is so damning. In the Book of Moses, which is the first few chapters of Genesis with restored material (including some serious prologue), there is an encounter between Moses and Satan that is very applicable to your situation and feelings. In the spirit of Nephi, I will “liken all scriptures unto us, that it might be for our profit and learning” (1 Nephi 19:23). In his instructive, typical experience, Moses, having first been enlightened by the truth of God’s existence, is tempted of the devil—he is given the choice of the two paths: “Satan came tempting him, saying: Moses, son of man, worship me” (Moses 1:12). As the Book of Mormon principally enumerates, “Man could not act for himself save it should be that he was enticed by the one or the other”—good or evil, God or Satan, etc. (2 Nephi 2:16). In other words, Moses can now demonstrate where his loyalties lie—he can prove his metal. No one can be considered to be truly good unless he has had evil presented before him and he has rejected it; likewise, no one can be considered truly evil unless he has had opportunity to refuse the good. The candle’s light is only bright when compared to the darkness that surrounds it. “Who art thou? For behold, I am a son of God, in the similitude of his Only Begotten; and where is thy glory, that I should worship thee?… Get thee hence, Satan; deceive me not; for God said unto me: Thou art after the similitude of mine Only Begotten…. Depart hence, Satan” (Moses 1:13,16,18). In essence, Moses is saying what you said, Thomas, though in a more certain tone, ‘Am I not a son of God?’ The implication being that if he is a son of God—if any of us are—then his very nature ought to point his affections and worship to his Father in Heaven and no one else. Yet we are tempted away from that; yet Moses was tempted away from that. Mark it well: the presence of temptation does not constitute inherent evil in our hearts—it is part of our earthly visa. Even Moses, surely one of the greatest prophets to ever live, was tempted of the adversary (as also the Savior, as we shall read). But, as stated above, the fight doesn’t end with Moses’ refusal to give in to the devil’s demands. After being cast out, something peculiar—yet, again, typical—occurs between the devil and Moses. I call it “The Devil’s Rebuttal.” It is an identifiable pattern in the lives of those who attempt to draw close to God and choose the good path in their daily choosing. Yet it is a subtle and easily misidentified reaction, often considered a reemergent aspect of an inherent evil as opposed to an outside attack. “And now, when Moses had said these words, Satan cried with a loud voice, and ranted upon the earth, and commanded, saying: I am the Only Begotten, worship me. And it came to pass that Moses began to fear exceedingly; and as he began to fear, he saw the bitterness of hell” (Moses 1:19-20). Now, I know I just said this is a ‘subtle’ reaction though the scripture describes Satan as ‘ranting’ with a ‘loud voice,’ but keep in mind that Moses’ spiritual eyes were open and he could see what most other mortals only feel, which feeling is usually dim and uncertain depending on our spiritual experience. Consider this: if Satan were to scream in your ear, “Thomas, you are nothing!” would you note the intensity of his tone or the depth of what you begin to feel is your nothingness? What I’m trying to say is that though we typically misidentify the source of these feelings in ourselves due to spiritual ignorance, the reality beyond the visible is that Satan’s counterattack is a violent retaliation, and we only sense it in our heart and mind (our spirit). Though we are typically unaware of Satan’s workings, Moses’ described feelings are certainly relatable: he experienced ‘exceeding’ fear and felt a bitterness that could only be described as hellish. And this is “The Devil’s Rebuttal.” It isn’t enough for us to have chosen the better path—to run from Satan’s temptation—but he chases after us and tries to tell us that the choice was wrong after having made the choice. In this case, Moses emphasized that his knowledge of his true identity (‘I am a son of God, in the similitude of [the] Only Begotten’) made Satan’s offer of worshipping him the obvious wrong choice, which led to the rebuttal, ‘[No,] I am the only begotten, worship me’! The Devil’s Rebuttal was designed to undo Moses’ convictions. And with this influence at his sway, the devil can fill our minds with his false credentials, attempting to authoritatively “put us in our place,” so to speak; to use his priesthood to remind us of our nothingness in his kingdom; to bring us to our knees in desperation and resignation when he forces us to realize that we have been seeking the wrong kingdom if it was not his. If Satan had power to inspire Moses with fear and bitterness, then he can surely bring others of us mortals low with his influence. He makes each of us feel as though we were created ‘for lesser things’ (trust me, it’s not just you). It may sound strange to your ears, Thomas, if you—as I—have never physically heard the loud voice of a unembodied spirit ranting upon the earth, to think that our own feelings of shortcomings and inadequacies come from a real, foreign source, designed to keep us from lifting our eyes above the horizon of this world. But think of the towering skyscrapers of New York City, or the showy cufflinks of successful suits, or of big returns on smart investments, and so on. All the worldly things you’ve ever wanted, even if just for your family’s sake, any of these things—all of these things—are just the Devil’s illusory kingdom, and the honest seeker of truth will find himself tempted by such things (just as Moses), tempted to worship mammon (Luke 16:13). “All this power will I give thee, and the glory of them: for that is delivered unto me; and to whomsoever I will I give it. If thou therefore wilt worship me, all shall be thine” (Luke 4:6-7, emphasis added). “And Jesus answered and said unto him, Get thee behind me, Satan: for it is written, Thou shalt worship the Lord thy God, and him only shalt thou serve” (Luke 4:8). “Nevertheless, calling upon God, [Moses] received strength, and he commanded, saying: Depart from me, Satan, for this one God only will I worship, which is the God of glory” (Moses 1:20-21). Remind yourself, and Satan (while you’re at it), that you are a Son of God, a stranger and a pilgrim in his world (see Hebrews 11:13), and that your destination and kingdom are not of his world (see John 8:23; 15:19). And then press on as he “rage quits” and tries to make you flinch. He has no power next to the God of endless worlds (our Father). It may take more fasting and praying, and certainly studying the scriptures, but such things constitute that ‘worship’ Moses and the Savior both refused to yield when Satan demanded attention. “And it came to pass that when Satan had departed from the presence of Moses, that Moses lifted up his eyes unto heaven, being filled with the Holy Ghost, which beareth record of the Father and the Son; and calling upon the name of God, he beheld his glory again, for it was upon him; and he heard a voice, saying: ‘Blessed art thou, Moses…. And lo, I am with thee, even unto the end of thy days….’ And behold, the glory of the Lord was upon Moses, so that Moses stood in the presence of God, and talked with him face to face” (Moses 1:24-26,31, single quote marks added). I like what you’ve written to me about the need for faith, but I still find myself surrounded by evidences that God, as a supreme controller of all things (nature, human affairs, etc. ), is cruel and unfair. For one, he put you and I into this cold and lonely world and then gave us sickness and infirmity, old age and all manner of undeserved harshness, on top of that. If this is what it means to be “created in his image,” then why have him as my father? All he appears capable of producing is a sad world of hurt. “And verily I say unto thee that thou shalt lay aside the things of this world, and seek for the things of a better” (Doctrine and Covenants 25:10). The commandment above is the theme of my letter to you, Thomas, and your ability to fulfill it will be at the root of your possible reconciliation with God. I assure you that at some day (hopefully sooner than the “last day”), you will recognize that our Father in Heaven is neither ‘cruel’ nor ‘unfair,’ but fair, loving, and wise in all his affairs with his children, whose names and circumstances he knows, including yours. But his knowledge of even all things does not diminish or absolve your responsibility to choose him and to set aside your sins that you may regain his presence. “But some man will say, How are the dead raised up? and with what body do they come?” (1 Corinthians 15:35). “Thou fool, that which thou sowest is not quickened, except it die” (1 Cor. 15:36). Question: as humans what do we sow? Answer: other humans (children), who are then racked with ‘sickness and infirmity, old age and all manner of undeserved harshness,’ as you pointed out in your letter. Sowing seed as an analogy of human reproduction is key to understanding the rest of what Paul is talking about, as you will see. Also note: what does it mean to be ‘quickened’? The Greek term is ζῳοποιέω zóopoieó, which means “to vivify” or “to animate,” and it is often used in reference to the notion of being alive. “But God giveth it a body as it hath pleased him, and to every seed his own body” (1 Cor. 15:37-38). “It is sown a natural body; it is raised a spiritual body” (1 Cor. 15:42-44). “All flesh is not the same flesh: but there is one kind of flesh of men, another flesh of beasts, another of fishes, and another of birds. “Also celestial bodies, and bodies terrestrial, and bodies telestial; but the glory of the celestial, one; and the terrestrial, another; and the telestial, another. “There is one glory of the sun, and another glory of the moon, and another glory of the stars: for one star differeth from another star in glory” (JST 1 Cor. 15:39-41, italics added). Paul wants to make it abundantly clear that what will be—what we will be—is, to borrow the modern phrase, “an entirely different animal” from what we are now. And he literally uses the examples of various classes of animal life to reinforce the idea. In effect, he says that as things now stand we have humans, which are a thing different from bears, which are a thing different from dolphins, which are a thing different from sparrows. And where does all this lead? It leads to the continued statement that inasmuch as those things are wholly different from one another (though all are forms of ‘flesh’), there will be different types of ‘bodies’ given to mankind in their resurrected, final state that will be things wholly different from one another, here described as ‘celestial,’ ‘terrestrial,’ and ‘telestial’ bodies (note that this last term is added by Joseph Smith through divine revelation). Now, these three differing ‘glories’ of bodies (as Paul puts it) provide the answer to the two questions he first predicted would be asked of him: ‘ how are the dead raised up? and  with what body do they come?’ Let us consider his answer to the latter first (number two). “And they who are not sanctified through the law which I have given unto you, even the law of Christ, must inherit another kingdom [other than the celestial kingdom], even that of a terrestrial kingdom, or that of a telestial kingdom. “For he who is not able to abide the law of a celestial kingdom cannot abide a celestial glory. “And he who cannot abide the law of a telestial kingdom cannot abide a telestial glory…” (Doctrine and Covenants 88:21-24, emphasis added). Borrowing the names Paul uses in describing the degrees of resurrected glory (i.e. celestial, terrestrial, and telestial), the above revelation states that the type of body one receives at the resurrection will determine the level of Heaven one can be admitted to (Paul spoke of the “third heaven” once, which corresponds to the ‘celestial kingdom’ named above; I have written to you about these levels or degrees before). Now that we have it established that our fully grown stature will be one of three general forms—with the kind designated as celestial being the greatest of all of these (by a long shot if we’re talking about a difference commensurate to the change in magnitude between the sun and moon), terrestrial being the middle, and telestial the least—we can turn to Paul’s answer of the first question he posed for himself (number , above): ‘how are the dead raised up?’ The answer is in the names he gave the types of bodies that will be in the resurrection: celestial, terrestrial, and telestial. The original Greek that Paul used for these words is known for two of the words, namely: celestial and terrestrial. Those words were ἐπουράνια epourania (“heavenly”) and ἐπίγεια epigeia (“earthly”), respectively. The King James translators, for whatever reason, rendered these instances of the words in their Latin/Old French forms, familiar to us today for their continued usage in modern English, but in other places in the King James Version of the Bible the words are rendered as heavenly and earthly, respectively, as they literally mean such. “If after the manner of men I have fought with beasts at Ephesus, what advantageth it me, if the dead rise not?” (1 Cor. 15:32). The third term, however, telestial, is, as mentioned before, a product of revelation through the prophet Joseph Smith. The term first appears (in conjunction with the other two, known terms) in a revelation he received concerning the resurrection of the dead while revising the Bible where necessary, going through it verse by verse, through direction from God. Sometime later, when reaching the verses of 1 Corinthians chapter 15, the word again appeared in its already understood place. That said, the word has proven to be somewhat problematic for scholars who refuse to recognize the calling of the prophet Joseph. For one, it is not a word that exists in our known English lexicon; furthermore, the word is set inline with two other known terms that, though their meanings are clear, go against any perceivable pattern that Joseph Smith seemed to establish. For example, the three degrees of Heaven refer to the eventual glorified destination of us, God’s children: the celestial inheriting as their kingdom, in fact, the earth on which we now live (though glorified—do you remember that?). Based purely on lexical meanings, it would seem more appropriate for the earth to be associated with the middle kingdom, the terrestrial kingdom (after all, it does mean “earthly”) and not the celestial. Nevertheless, the revelations state that righteous will inherit the earth as the kingdom of the celestial. To add to this seeming inconsistency on the part of Joseph Smith’s revealed eschatological system, the connection between 1 Corinthians 15 verses 40 and 41, is further derided by critical scholars in that Paul connects the light of the sun as being typical of this celestial degree of glory and not the earth, and the terrestrial seems to lose all relatedness when the moon is set forth as its symbol. But symbol of what? It would be well for the student of the scriptures to remember that Paul is here answering specific questions. We will return to this in a moment. The claim put forth by Joseph Smith is, in essence, that Paul’s original letter contained a third term in the Greek that we are not now familiar with: telestial. That word can be demonstrably shown to be derived from τέλος telos, which means “an end” or “consummation” (see Strong’s Greek Concordance, 5056). It is related to the English word “telescope,” whose function is not fully realized until the tool is extended to its ‘end.’ The Latin/Old French suffix “-al” is imposed on the Greek τέλος telos to produce an unfamiliar but agreeable new adjective to describe the lowest form of resurrected bodies. “[Regarding those who obtain celestial bodies:] these shall dwell in the presence of God and his Christ forever and ever. “These are they whom he shall bring with him, when he shall come in the clouds of heaven to reign on the earth over his people. “These are they whose bodies are celestial, whose glory is that of the sun, even the glory of God, the highest of all, whose glory the sun of the firmament is written of as being typical” (Doctrine and Covenants 76:62-64,70, emphasis added). “[Regarding this who obtain telestial bodies:] these are they who shall not be redeemed from the devil until the last resurrection, until the Lord, even Christ the Lamb, shall have finished his work” (Doctrine and Covenants 76:85, emphasis added). Thus, the adjectives Paul ascribes to the third, second, and first heavens represent the manner of resurrection its inhabitants will go through; whereas the symbols of the sun, moon, and stars represent the kinds of bodies, in terms of glory or power, that its inhabitants will possess. “And so it is written, The first man Adam was made a living soul; the last Adam was made a quickening spirit. “Howbeit that was not first which is spiritual, but that which is natural; and afterward that which is spiritual…. “And as we have borne the image of the earthy, we shall also bear the image of the heavenly” (1 Cor. 15:45-46,49). Thomas, there is a path established by God whereby you too can obtain a resurrected body of celestial glory—to ‘bear the image of the heavenly’—which body will come from the heavens with the Son when he comes to reign in glory. This path has been made clear by the words of living prophets, and it all begins by following the example of the Savior by going down into the waters of baptism to be born of water by an authorized minister—someone who holds the true priesthood delegated from Jesus Christ himself. For each of us, the commencement of this path begins with faith, and the fruits of faith is repentance, and the fruits of repentance are in the saving ordinances, beginning with baptism. Do everything in your power, Thomas, to obtain that celestial body through the sacred ordinances that have been brought from heaven for that purpose, for it is what your Father has done, and it is what He asks you to do. I still haven’t got around to changing my world view, as you suggested. But I feel concerned that even if I begin to see God’s hand in my past, I may not recognize it in my future. Some people would suggest that the LDS church is actually the devil’s church. But couldn’t that be said of any religion? I mean, I’m not sure that the devil’s that interested in all of this. I haven’t felt that God’s even that interested in all of this, so why would the devil care? “Will I accept of an offering, saith the Lord, that is not made in my name? “Or will I receive at your hands that which I have not appointed? “And will I appoint unto you, saith the Lord, except it be by law, even as I and my Father ordained unto you, before the world was? “I am the Lord thy God; and I give unto you this commandment—that no man shall come unto the Father but by me or by my word, which is my law, saith the Lord” (Doctrine and Covenants 132:8-12, emphasis added). This concept, that everything the Lord does with regard to us is by law, is crucial to understanding how revelation works because it too is bound by certain laws. I intend to lay before you some of these rules and principles so that you may be aided in perceiving truth from error, which leads me to the second thing you ought to be aware of: the devil is in fact very interested in religion. If you want evidence of this, just look at the several factions and sects of religion throughout the world. God is the author of order; Satan is the author of confusion. There is ultimate truth and a true religion, the Kingdom of God in embryo, but the devil would have such knowledge obscured, and he would prefer to destroy it if he could. Nonetheless, the devil rejoices when he goes on undetected in the world, and sometimes in the church—he laughs when his lies go unperceived. “And whatsoever is more or less than this is the spirit of that wicked one who was a liar from the beginning” (Doctrine and Covenants 93:24-25). So there it is, pretty straight forward, with a little reminder that anything that is not true is error, which is the devil’s domain. Truth is the ‘knowledge’ of what was/is/will be—the ways things really are—not the mumbo jumbo we make up to try and explain things. In The Book of Mormon, we find this statement: “And by the power of the Holy Ghost ye may know the truth of all things” (Moroni 10:5, emphasis added). What the devils seek to do then is confuse error for the truth, and they are really, really good at doing just that. And, unfortunately, probably more than at any other time in earth’s history, mankind is worshipping these errors and believing fiction for truth almost ubiquitously. And, even more unfortunately, the devils don’t stop with passing error as truth, they are also ensuring that mankind stomps out the truth when it does pop up. This is not a new campaign—true prophets have always been stoned by the unbelievers—but it’s like a landslide against all things “good[, which are] just and true” in our modern world (Moroni 10:6). So how do you distinguish what is true from what is error? Note that I use the word error instead of false. I do this to emphasize that just because something is false doesn’t mean that it’s immediately recognized as such. I feel that the word error carries with it a sense of deception. I doubt that the world at large would love to claim that they’re idolizing falsehoods instead of solid truth, but that’s why the false spirits deceive—“it’s a trap!” The devils are out to blind us from finding our way to the glory of God. For those who have not found the truth, the false spirits’ actions are to keep them from the truth; for those who have found the truth, the false spirits’ actions are “calculated to bring disgrace upon the Church of God…” (Scriptural Teachings of the Prophet Joseph Smith [STPJS], 214). Again, we must know the laws that God has instituted to tell his commands from all others. “Ye shall know them by their fruits. Do men gather grapes of thorns, or figs of thistles? “Even so every good tree bringeth forth good fruit; but a corrupt tree bringeth forth evil fruit. “For behold, a bitter fountain cannot bring forth good water; neither can a good fountain bring forth bitter water…. “Wherefore, take heed… that ye do not judge that which is evil to be of God, or that which is good and of God to be of the devil. “…The way to judge is as plain, that ye may know with a perfect knowledge, as the daylight is from the dark night. “…Every thing which inviteth to do good, and to persuade to believe in Christ, is sent forth by the power and gift of Christ; wherefore ye may know with a perfect knowledge it is of God. “But whatsoever thing persuadeth men to do evil, and believe not in Christ, and deny him, and serve not God, then ye may know with a perfect knowledge it is of the devil; for after this manner doth the devil work, for he persuadeth no man to do good, no, not one; neither do his angels; neither do they who subject themselves unto him” (Matthew 7:16-18; Moroni 7: 11,14-17, emphasis added). This is the first law to distinguishing truth from error. If you pray to know if The Book of Mormon is true and your mind is filled with arguments from an anti-Mormon pamphlet saying things like, “The Bible should not be added to,” etc., then I dare you to open to almost any page in The Book of Mormon and ask yourself, “Am I being invited to Christ? Am I being taught to do good?” or better yet, “Am I being persuaded to do evil?” Open The Book of Mormon to 3 Nephi chapter 11 and answer those questions. The fruit of The Book of Mormon can silence all invented arguments in an instant if you just take the effort to seek for the fruit. You can have a perfect knowledge of its truthfulness. This same test can be applied to a prompting or revelation you receive from the Spirit. If the fruit of the prompting is good (invites to believe in Christ and do good), then you know that the spirit was of God. If the fruit is bad (do evil, don’t believe in Christ, don’t serve God, etc. ), then you know that the spirit was not of God but was a false spirit, a spirit in the domain of error. “Tell the brethren to be humble and faithful and be sure to keep the Spirit of the Lord, that it will lead them aright…. They can tell the Spirit of the Lord from all other spirits—it will whisper peace and joy to their souls; it will take malice, hatred, strife and all evil from their hearts, and their whole desire will be to do good” (quoted in Juvenile Instructor, 19 July 1873, 114, emphasis added). The presence of truth, that which the Spirit of the Lord communicates, will bring peace to our hearts. The devil may bring a convincing argument to your mind, but he cannot imitate peace. He can, however, lull and pacify, or create the feeling of carnal security—something I’d bet most people would term comfort (see 2 Nephi 28:21). Someone I know recently joined the church once she discovered the truth inside of it. She described to me how that she would wonder about the Gospel and its tenets, which were opposed to her lifestyle choices up to that point, and feel something tell her that she was fine, that there was nothing wrong with her, but that the Gospel was simply false. She said that such a justification would sweep over her and she would feel comfort in her situation. She could receive this comfort over and over. And, importantly, that’s what she needed to do to retain that comfort because It never lasted. She thought her comfort was the answer to her question of whether or not the church was true. It was not until she yielded to the inviting of the Spirit of God, to believe in Christ’s restored Gospel, that she was introduced to true peace. It was a different feeling altogether, and, importantly, it lasted. Truly, she testified to me that “Jesus… said unto her, Whosoever drinketh of [the devil’s] water shall thirst again: […] But whosoever drinketh of the water that I shall give him shall never thirst; but the water that I shall give him shall be in him a well of water springing up into everlasting life” (John 4:14-15). “Did I not speak peace to your mind concerning the matter? What greater witness can you have than from God?” (Doctrine and Covenants 6:22-23, emphasis added). There’s a story from back when the church was just newly arrived in Utah wherein a church member rode on horseback as quickly as he could from his home to the prophet Brigham Young’s residence to tell him an important message. According to the man, an angel had appeared to him with a commandment for Brigham Young. Before he could tell Brigham Young his message, however, Brigham Young told the man to go back and “tell that angel to go to Hell,” since that’s where the angel had came from. “If worthy, we are entitled to receive revelations for ourselves, parents for their children, and members of the Church in their callings. But the right of revelation for others does not extend beyond our own stewardship” (James E. Faust, “Communion with the Holy Spirit,” Ensign, Mar. 2002, 4). This means that if you, Thomas, walk into a meeting with the missionaries one day having felt prompted to tell one of them that they need to return home as soon as possible, you can know by this law that it is not of God. This message—this command—would have come through the proper channels to reach that missionary. Per the quote above, it would have to have come to his Mission President. Hence the only person in God’s orderly kingdom who can give commandment for the whole world is the person at its head, the living prophet. Read the scriptures and you will see that this pattern is consistent and ancient. “How do men obtain a knowledge of the glory of God, his perfections and attributes?… By devoting themselves to his service, through prayer and supplication incessantly strengthening their faith in him, until, like Enoch, the brother of Jared, and Moses, they obtain a manifestation of God to themselves” (Lectures on Faith, 2). “And as [Paul] tarried there many days, there came down from Judæa a certain prophet, named Agabus. “And when he was come… he took Paul’s girdle, and bound his own hands and feet, and said, Thus saith the Holy Ghost, So shall the Jews at Jerusalem bind the man that owneth this girdle, and shall deliver him into the hands of the Gentiles. “…And they of that place… besought [Paul] not to go up to Jerusalem. “Then Paul answered, What mean ye to weep and to break mine heart? for I am ready not to be bound only, but also to die at Jerusalem for the name of the Lord Jesus. “… [But Paul] would not be persuaded… saying, The will of the Lord be done. “And after those days [Paul]… went up to Jerusalem. “[There,] the chief captain came near, and took [Paul], and commanded him to be bound with two chains…” (Acts 21:10-15,22). Agabus, filled with the Holy Ghost, prophesied a bad ending to Paul’s journey, which came true. Yet Paul knew that the Lord had commanded him to go and face it, and so he went. As an Apostle, Paul was “up the chain of command,” as it were, from Agabus, so that Agabus would not receive a revelation telling Paul what to do. But, unlike Brigham Young, Paul did not tell Agabus to send the spirit that prompted the prophecy to go to Hell. The reason is that Agabus did not receive a command for Paul that would have contradicted Paul’s earlier revelation to go to Jerusalem, but simply prophesied future events. This is a very important distinction, for it can make the difference in one’s understanding and perception of truth and error. “Some will say, ‘try the spirits’ by the word (1 John 4:1). ‘Every spirit that confesseth that Jesus Christ is come in the flesh is of God, and every spirit that confesseth not that Jesus Christ is come in the flesh is not of God.’ (1 John 4:2-3) One of the Irvingites once quoted this passage whilst under the influence of a spirit, and then said, “I confess that Jesus Christ is come in the flesh.” And yet these prophecies failed, their Messiah did not come; and the great things spoken of by them have fallen to the ground. What is the matter here? Did not the Apostle [John] speak the truth? Certainly he did—but he spoke [in context] to a people who were under the penalty of death, the moment they embraced Christianity;… [so] this was consequently given as a criterion to the church or churches to which John wrote. But the devil on a certain occasion cried out, “I know thee, who thou art, the Holy One of God”! (Mark 1:24). Here was a frank acknowledgment under other circumstances that Jesus had ‘come in the flesh.’ On another occasion the devil said, “Paul we know, and Jesus we know”—of course, ‘come in the flesh’ (Acts 19:15) No man nor sect of men without the regular constituted authorities, the Priesthood and discerning of spirits, can tell true from false spirits. This power they possessed in the Apostles’ day, but it has departed from the world for ages” (STPJS, 213). Is it no wonder that I started off this letter by informing you that most all of the world is ‘oblivious to the knowledge’ that could bring them out of darkness and into light? This precious knowledge is bound by the laws of God, which laws are governed by the priesthood as restored by Joseph Smith (another topic for another time!). Suffice it to say that the knowledge I’m now presenting you would not be around without the restoration of the Gospel through Joseph Smith the prophet. “The Spirit does not get our attention by shouting or shaking us with a heavy hand. Rather it whispers. It caresses so gently that if we are preoccupied we may not feel it at all…. “Occasionally it will press just firmly enough for us to pay heed. 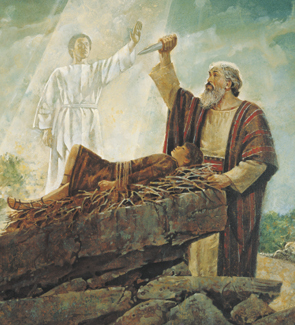 But most of the time, if we do not heed the gentle feeling, the Spirit will withdraw and wait until we come seeking and listening and say in our manner and expression, like Samuel of ancient times, ‘Speak [Lord], for thy servant heareth.’” (“The Candle of the Lord,” Ensign, Jan. 1983, 53). As an investigator to the church, Thomas, you may occasionally receive light and truth to your understanding from the Holy Ghost. But when you are baptized and given the gift of the Holy Ghost, you have the right to constant revelation as long as you stand worthy, as opposed to intermittent insights. Your ability to understand the scriptures, and draw out from them the mysteries of God, will be instantly enhanced. Hopefully by studying some of the material I have given you thus far in this letter, you will be able to begin recognizing the difference between your own thoughts and the promptings of the Holy Spirit and the promptings of a false spirit. When you are governed by correct principles, you can set sail with confidence in the seas of revelation; lose sight of those principles, however, and the devil will seek to capsize you in an instant. Always “have [your revelations] tested by the word of God; [otherwise] …proving that [you love] darkness rather than light, because [your] deeds are evil” (STPJS, 215). Truth by its nature cannot be contradicted, so always “compare your [revelations] with the scriptures and the teachings of the living prophets” (Preach My Gospel, 98). If what you receive works against established doctrines and procedures, “[you] should be very wary about accepting it, and [you] should not share it with others” (Gerald N. Lund, “Is It Revelation?” New Era, July 2004). Nonetheless, the seas of revelation are an exciting place to be, and by and by, as your faith and experience increase, you may have the heavens opened up to you just as the ancient prophets we read about in the Bible. No surprise then that with the restoration of God’s priesthood and laws, a revelation has come through the prophet Joseph Smith detailing how to distinguish between good and bad angels. Now, you may be thinking, “Well, good angels wear white and bad angels wear red, right?” If the devils were not trying to deceive us, then yes, it could be that easy. But Satan’s work has always been the work of counterfeit; if he can’t get us to choose evil outright he gets us to choose evil dressed up as good—error disguised as truth. “For instance, Jesus said: Handle me and see, for a spirit hath not flesh and bones, as ye see me have. “Secondly: the spirits of just men made perfect, they who are not resurrected, but inherit the same glory. “When a messenger comes saying he has a message from God, offer him your hand and request him to shake hands with you. “If he be an angel he will do so, and you will feel his hand. “Ask him to shake hands with you, but he will not move, because it is contrary to the order of heaven for a just man to deceive; but he will still deliver his message. “If it be the devil as an angel of light, when you ask him to shake hands he will offer you his hand, and you will not feel anything; you may therefore detect him. “These are three grand keys whereby you may know whether any administration is from God” (Doctrine and Covenants 129:1-9). Did you catch the giveaway between good spirits and bad ones? It comes back to the principle of truth. Only the devil or a false spirit will enter the domain of error. In the three examples above of a being appearing in light bearing a message from God, the only one who attempts to do something he cannot do (physically shake hands) is the evil spirit. A spirit attempting to respond to the request that hands be clasped is a deception because it cannot be done. A good spirit would not enter the domain of error, whereas an evil spirit would, outstretching his arm as if he were capable of actually shaking your hand. Whether it be the spirit of prophecy, a prompting to action by the Holy Ghost, or a message from an angel, the Lord has instituted laws whereby counterfeits may be detected and eliminated. If you have the knowledge, you may even detect a false angel by the color of his hair, or the presence of wings (Angels do not have wings; See STPJS, 162 & 214). In God’s kingdom of perfect order, there is no room for blame or aspersion. Several years ago I saw an article in a Utah newspaper describing a deranged mother’s slaying of her husband and children. When questioned as to her motives, she responded that she had been told by the spirit of God to do so as a test of her willingness to obey. She believed that at some point her obedience would be proven and her family would be miraculously returned to her. But she was imprisoned instead for the senseless murdering of her family. Was she justified in her atrocities because she was being obedient, even if the end result seemed non-miraculous? I will state with complete firmness that no man or woman who submits any degree of obedience to a false spirit will find any degree of justification in God’s eyes. “But what about Abraham?” You might ask. “He followed a command to take his son up and sacrifice him on an alter. Wasn’t that just like this woman who killed her family? Was this her Abrahamic trial?” No it wasn’t. In one case, we find a false spirit at the head; in the other, the spirit of God. That is why it is so important to be able to detect the Lord’s true servants. If a true messenger of God delivered the message, and I confirmed the truth that the message was of God, I would then have the certain knowledge that it was of God, and not knowing the end from the beginning, I would have faith “accounting that God was able to raise him up, even from the dead” just as Abraham had to fulfill the command (Hebrews 11:19). In summary, Thomas, I want you to know that God has established laws whereby every ministration from Him may be known with certainty, ‘as daylight is from the dark night.’ Though these are not all the laws that exist, the principle remains here exemplified that you may gain a knowledge of the truth of all things. You may come to know that The Book of Mormon is true. You may gain a knowledge that what the missionaries just shared with you is true. You may gain a knowledge that Heavenly Father exists as the missionaries have taught He does, and as the scriptures teach He does. You may come to know, as you know that I live having seen me face to face, that the Savior, Jesus Christ, lives. And you may not be deceived. A knowledge of such things does not negate the need for faith. When you know that Christ lives, then you must give your life to Him. Then if you are asked to deny that Jesus is the Christ or die, what will your faith bring you to do? If you know that The Book of Mormon is true and you are asked to be baptized and to lead your family to the same, what will your faith bring you to do? Jonah tried to sail away from his knowledge. David thought Bathsheba was worth more than his knowledge. But Abraham became known as the father of the faithful because he was true to his knowledge. Detect the truth, Thomas. Do everything in your power to have a knowledge of the truth. Then ask yourself, “What will I do now?” That will be the measure of your faith. P.S. I think that I would like to write you another letter soon detailing the differences and relationships between faith, belief, and knowledge since we dipped our toes into it at the end here. In olden times, a Christmas tradition was a song competition between the men and women of a given town. The contest was to see who could sing the highest praise of their respective symbol: the men were to sing of the holly; and the women, the ivy. At the end of the singing, the two groups would reconcile beneath a row of mistletoe. Many of these songs have been forgotten to time, but some, particularly those sung by the males, have survived. 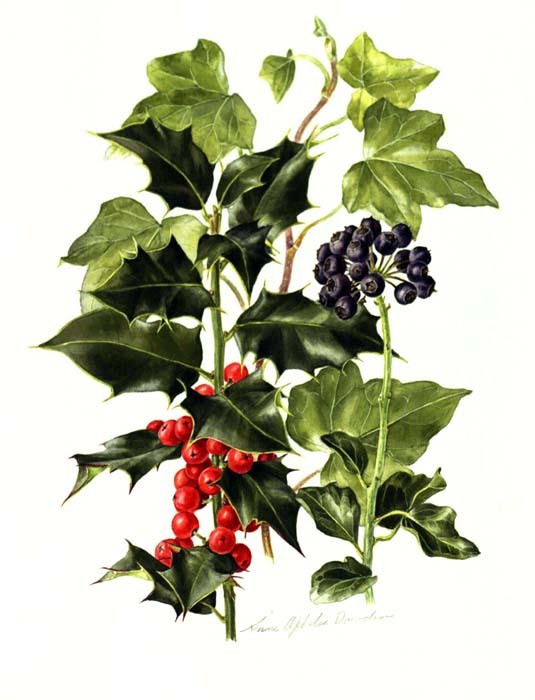 The carol, The Holly and the Ivy, is a product of such remembered songs. I’ve combined those ancient themes, along with the legend of mistletoe being the Herbe de la Croix, whose wood was said to be that used to make the cross of Jesus’ crucifixion, to form an original poem set in the meter of said carol and using Middle English (as best I could). When a love and a life was giv’n, at once to save us all. Whose budding romance betoken’d our savior, O so fair. These lovers then appear evergreen, in the light of day. Upon the wintry day did meet, when they were both alone. But she kept her feelings hidden, to see if he’d be true. “Not so,” denied the ivy, “when all is grey and iced. “These days I am striving outwards, to be like Jesus Christ. “I too am like the savior—I’m trying to do my part. “And Mary bore sweet Jesus Christ, and swaddled him in silk. “For Christmas day is on us now; by new year I’ll be dead. “There’s yet more ways in which I try to be like Jesus Christ. “And Mary bore sweet Jesus Christ to do poor sinners good. “For Christmas day is past us now; by new year I’ll be dead. “There’s one more way in which I try to be like Jesus Christ. “And Mary bore sweet Jesus Christ for to redeem us all. “Now Christmas day is long past us?” questioned the ivy. “Not so,” cried the lone ivy, “now thou art grey and iced. Then softly came the stranger’s voice, “I am the mistletoe. “I know sweet Jesus Christ,” said the old plant draped in frost. “I was once a great tree from whom they fashion’d out His cross. Picked up her cold, dear loved one, and gave unto him a kiss. Whose flowered romance betoken’d our savior, O so fair. Through Him thy love shall be evergreen, in the light of day.